Last weekend, Kara and I drove up foliage-packed Route 12 to celebrate our traveling guru friend, Charlotte’s 30th birthday with close friends and family. Upon entering the vibrantly-hued modern kitchen with touches of folk art, we were overcome by wafts of Steve’s fresh baked bread and homemade chicken stew simmering on the stove. This was our kind of welcome. We made our way outside to join everyone around a fire and were quickly instructed to change into sneakers and throw on some bright orange vests to explore the surrounding woods. 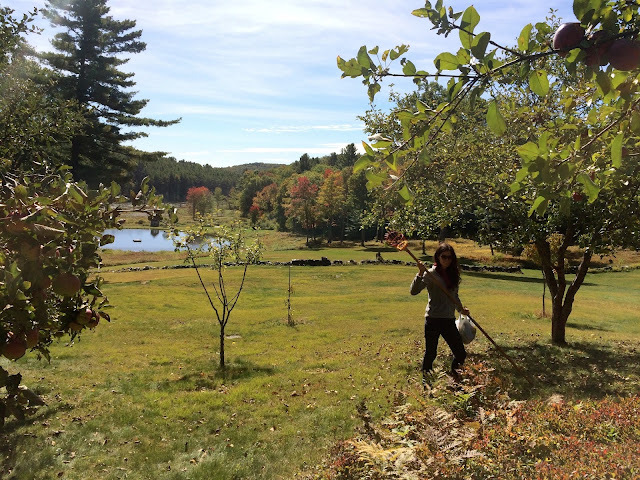 We hiked through Vermont's winding trails hopping over trickling streams and exotic mushrooms. After our trek, we returned to indulge in shucked oysters thanks to Portland Andy, veggie-packed homemade pizzas and local microbrews for lunch. The remainder of the evening was focused on our favorite things- catching up with close friends over good music, delicious food and an array of beverages. Charlotte and her beau cooked pork belly and salmon inside of the wood burning oven for dinner, and the remaining guests whipped up simple salads and sides straight from the garden. Julie’s carrot cake studded with orange birthday candles was the ultimate ending to this memorable evening. If this was not special enough, we left our happy retreat after brunch the next morning with our hands full of freshly picked produce. 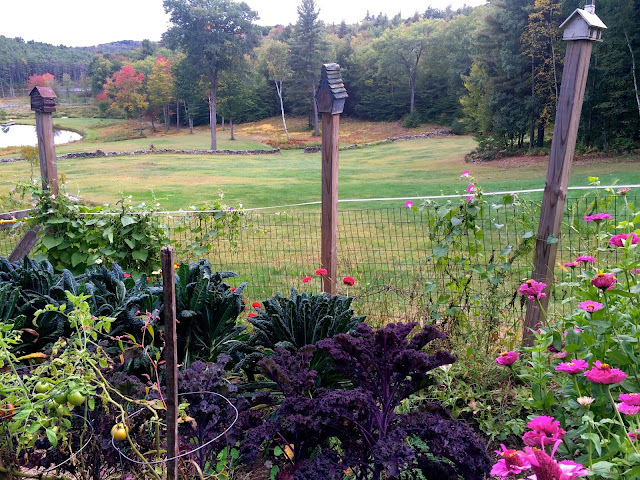 Charlotte’s family has a remarkable garden full of an extensive array of veggies, herbs, and flowers. We were overcome with excitement and inspiration as we dug for potatoes, pulled up carrots, picked for apples and chopped off massive amounts of kale. Kara and I were overwhelmed by the hospitality and generosity. I returned home to Cambridge ready to incorporate some country flare into an overflowing chopped salad for some city friends. I made a sweet yet tangy honey and goat cheese vinaigrette to dress the beautiful multi-colored kale. A wonderful medley of fall flavors! Pour the kale into a large bowl. Lightly drizzle the leaves with EVOO and a sprinkling of salt. Feel free to massage the kale with your fingers (or tongs). Set the bowl in the refrigerator for 20 minutes. Meanwhile, whisk together the vinaigrette ingredients in a small bowl and set aside. Add the sliced fennel and cherry tomatoes to the large bowl of kale. Add the vinaigrette and toss to coat. Let sit for an additional 5 minutes, then season with salt and pepper to taste. Sprinkle with the remaining goat cheese crumbles on top and serve. Serves 4-6 sides. I like to keep the salad simple, featuring the fresh kale and tangy vinaigrette but by all means, feel free to add some walnuts, sliced apple, or whatever you might have on hand to this versatile salad!